And, lucky me, by the time my yoga class is over, their happy hour menu is in effect! $4 for veggie sliders? Yes please! Oh, sweet deliciousness! These sliders are just as amazingly tasty as 5 Napkin’s full-sized veggie burger. The patties are moist and flavorful, and in case you’re unfamiliar with the 5 Napkin Veggie burgers, that’s not undercooked meat that’s making them look pink – it’s beets! One of my favorite veggie burger ingredients! 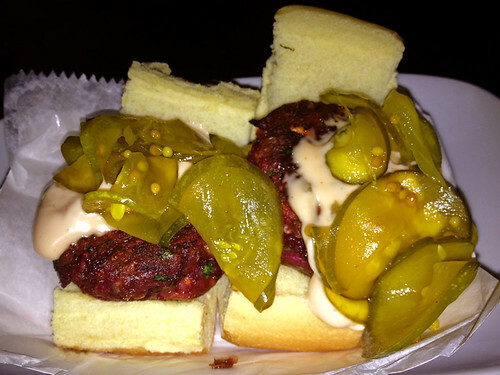 They are topped with plenty of pickles, and that yummy, tangy “5N” sauce. Really the only difference between this and the regular veggie burger, other than the size (obviously) is that the sliders don’t come with tomato and lettuce. Probably because there’s no room left for them! And the bun seemed softer and sweeter, maybe a different type of bread. 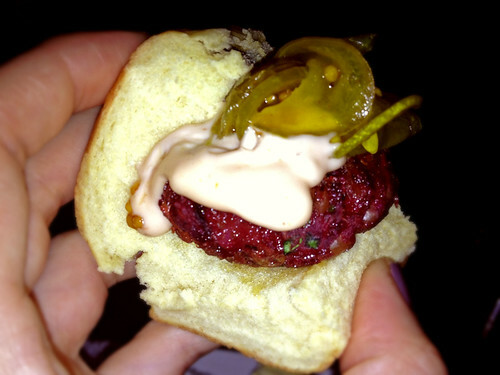 A $4 order of sliders includes two adorable little baby burgers. 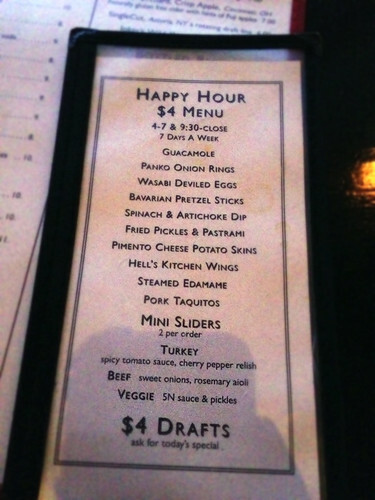 I also ordered a happy hour guacamole, and that along with the sliders was filling enough for me. But if you wanted to get really crazy, a hungry person could probably eat 2 orders of the sliders (4 total – about the size of a regular burger). I’m going to go ahead and say these are 5-star sliders, because the full-sized 5 Napkin veggie burger is a 5-star burger, and these mini versions of that burger are equally awesome! Read my original review of the full-sized 5 Napkin veggie burger here. wow they loo so delicious! thanks for sharing!